Doug Tinney gives a look into the past of Lake Elizabeth as well as a comprehensive look at the park today. The book is one part history lesson and one part human behavioral study. Tinney delves into the psyches of the parks “regulars”, studying the differences and habits of the morning, afternoon, and evening crowds. 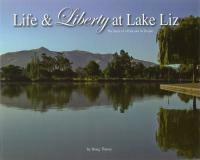 The book also talks about the parks recreational groups and other interesting information.